Blood of the Reich is a book about Nazi fanatics attempting to gain control of a mysterious power called the Vril, which was said to have been gotten by an ancient civilization that lived and died in a secret valley in Tibet. The book alternated between the past, in 1938-1945, and the present. It included mind boggling science, huge Nazi schemes, betrayal, icy mountains, explosions, and more. I liked this book because of its intriguing plot and characters, along with the action and adventure that occurred throughout the story. I would recommend this book to devoted readers who can handle some scientific terms and large plot twists. This book was hard to put down and highly entertaining! Mathilda Savitch is a story about the troubling time Mathilda goes through after her sister's death. Mathilda sees the world in a different light; she vies for attention, especially her mother's, and the only way to get that attention is by becoming bad. And yet, Mathilda is still trying to find her place in the world; she, like any other teen, is trying to discover who she really is. But she's also going on another quest: to find the guy who pushed her sister in front of the train. As she rummages through her sister's things, she uncovers secrets that her sister has always kept hidden, but that's not the only thing she uncovers: she discovers the truth about herself and the world. This book was amazing despite some issues with language and a bit of content. The ideas and thoughts explored are ones that plague people today and Lodato does a great job bringing them to the forefront. It really gets you wondering about issues that many times we try to ignore. I would recommend this book to anyone who find him or herself wondering about the mystery of life. Anyone who likes to wonder and who likes to feel and get his or her heartstrings pulled would love this book, although as a warning there is some very foul language and mature content. Jenna, Kara, and Locke were great friends who stuck together through everything, but one day an accident happens and as they lay dying, Jenna's father scans and saves their minds in the hopes of saving them. 260 years later Locke and Kara awaken to a new world and learn that Jenna has been alive for the past 260 years and has done nothing to save them from the darkness. After finding out that they are nothing more than floor models for prospective buyers who may want to preserve their minds for the future, Locke and Kara run away and find themselves in a whole new world. The two get separated, but their destination is the same: Jenna. Locke finds himself rushing against the clock because he knows that Kara's mad, he knows she wants revenge. 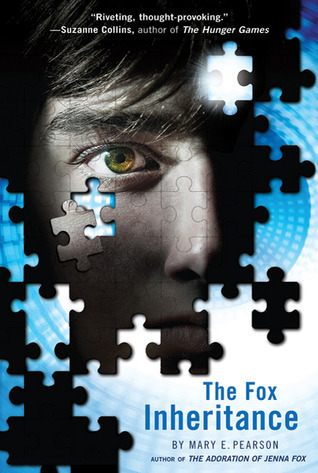 This book is fantastic; the sequel to The Adoration of Jenna Fox, this book gives you insight as to what happened to the other characters and the lives in store for them. The future world that Pearson creates is realistic. This book will leave you wondering about the importance of friendship, trust, and the human mind and soul. I would recommend this book to everyone who loves to wonder about the future and where mankind is headed. It will definitely leave you wondering and questioning. If you loved The Adoration of Jenna Fox, then this book is a must-read. In Gentlemen, Tommy, Mixers, Bones, and Micheal are a tight-knit group that no one in school or outside of school dares to mess with. One day, while in class, Tommy throws a "tantrum" and is sent to the vice-principal's office, but he never makes it there nor does he go home. Tommy disappears and the rest of the group can't find him anywhere. They begin to worry that something is wrong and are convinced that Tommy has been brutally murdered, especially when their English teacher, Mr. Habermann, the one man who actually calls them "gentleman", begins acting very strangely, speaking of murder and the ideas of crime and punishment. Gentlemen is definitely a book that I liked. It's very fast paced and gripping and has you enthralled until the very end. The ending itself is unexpected and although it may seem slightly disappointing at first, continue reading on till the end and you'll find that feeling of disappointment replaced with one of content. By the end of the book, you'll find yourself wondering about the true meaning of friendship and respect. This book is one that I would recommend to everyone and anyone who loves to read and wonder about the deeper things in life. Yet, I believe that those who like reading crime thrillers and stories about the dark side of society would greatly appreciate this book. Divergent is set in a post apocalyptic future. Everyone is split up into 5 groups called factions. At 16, you have to choose which faction to initiate into. Finding out she's divergent, which means she's meant for all the factions and can't be affected by any mind control devices, Beatrice leaves her faction and when one faction tries to take over, it's her job to save the world. Divergent is one of the best books I've read. It makes you think about your own feelings toward life but still makes you want to read about Beatrice's. People who really enjoy reading books like The Hunger Games or the Uglies series would really love this book.